peacock feathers is off the needles! Finally! More than two years since I started it, I finally got up the energy to finish it up. Of course, it still needs a good bath and blocking. Here are some “before” photos – it still looks pretty awesome, even unblocked. Lovely and you get your needles back! ‘like’-ing this on my Google Reader just wasn’t enough…. I LOVE IT!! Just gorgeous!! It’s beautiful, even in its unblocked state. 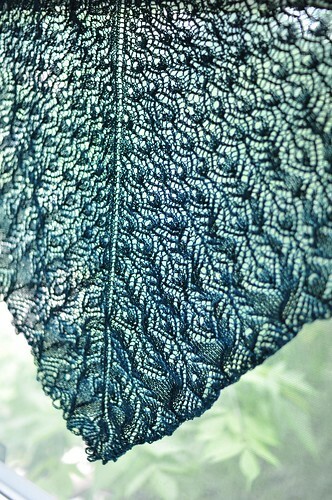 Gives me some inspiration to finish the shawl dragging on my needles. That is so beautiful: love the colour and the lacy pattern. 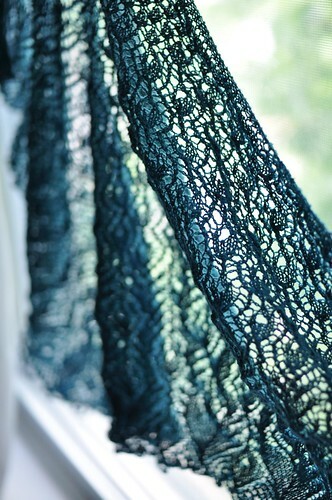 I need to try my hand at lacy shawls . . .
Congratulations! 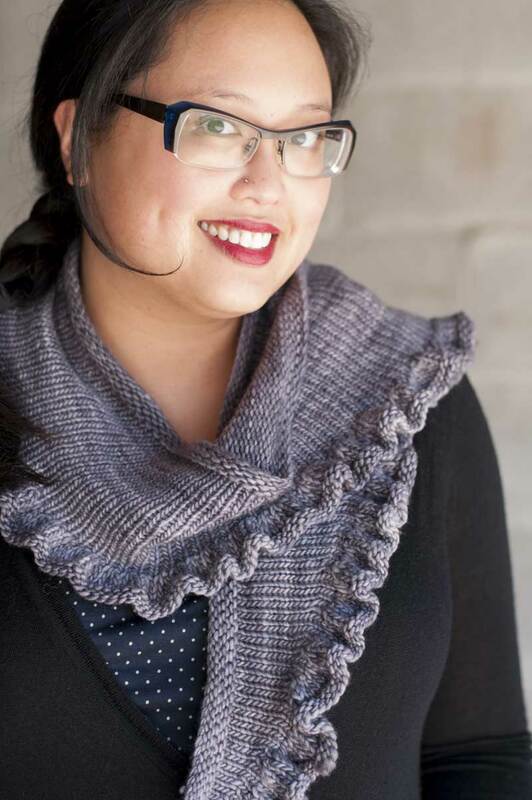 That’s one of my all-time favorite shawl patterns. So much so that I occasionally toy with knitting it a third time! Looks great! It’s going to be a stunner, for sure. I knitted one about 5 years ago, and it’s still one of my fave projects. Can’t wait to see it blocked! it already looks beautiful, I’m waiting eagerly for the “after” photos! I just got my Peacock Feathers done, but I got it blocked too this past weekend. It’s almost the same colour, too. Enjoy. It is beautiful. 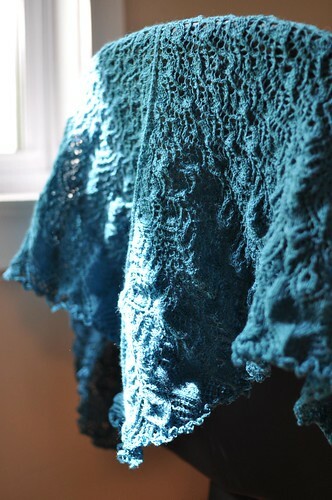 Anyone who can make unblocked lace look this exciting is an amazing photographer (and knitter)! Congratulations! I also finished my 2 year old Thermal recently! Lovely color and pattern! It will be fun to block and see the change! Beautiful! Congratulations on finishing! The blocking will absolutely transform it… can’t wait to see! Gorgeous! Are you going to have the pattern for sale? I desperately want to knit this to go with my wedding dress!